Practicing Exceptional Integrity – Love. Life. Practice. Let’s say you volunteer to be part of a study. It’s pretty simple; you’re told that you’ve been randomly paired with a person you don’t know and will never meet, who is waiting in another room. There are two simple tasks to be assigned, one to each of you. One task will result in a reward being given; the other task will not. You, the subject, will decide which of you is rewarded, which of you is not. Your partner is already here, in another room, and the two of you will not meet. Your partner will be told that the decision was made by chance. You can make the decision in any way you like. Oh, and here is a coin: Most people in this study seem to think that flipping the coin is the fairest way to make the decision. If you’re like most people, given the hypothetical situation your answer to my question is that you would take out the coin and let random chance decide who got the reward. It’s only fair, right? And you want people to think you’re fair. What if there’s no one around to know if you’ve been fair or not? 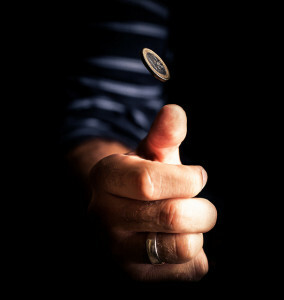 When the study was done by C. Daniel Batson of the University of Kansas, the results were that only 50% of the people left in the room alone to make their decision actually chose to use the coin. Of those 50%, 85-90% of them chose to get the reward themselves. But that’s not surprising, right? They’ve already shown that they aren’t interested in fairness; it follows that they’d be selfish and take what they could get, especially with no consequences for being selfish. We can take some comfort in the fact that 50% of the people did decide to take out the coin and flip it in order to decide fairly who got the reward. Of the people who actually took out the coin and flipped it – even with it clearly marked as to who would get the reward on each face – 85-90% of them decided to take the rewards for themselves anyway. Think about that for a second. Even with a set of rules in place – “whoever the coin says gets the reward will get it” – a set of rules that they had chosen voluntarily to follow – they ignored the result and took what they wanted anyway. 90% of the time, at least. They wanted the testing staff to think they’d been fair (by unwrapping the coin so it looked like it flipped) but they went ahead and did whatever they wanted anyway, because there were no consequences. To appear fair by flipping the coin, yet still serve self-interest by ignoring the coin and assigning oneself the positive-consequences task, seems to be evidence of moral hypocrisy. Ironically, this hypocrisy pattern was especially strong among persons scoring high on a self-report measure of moral responsibility. I have no idea how to fix the problem of moral hypocrisy. In fact, as you read the chapter on hypocrisy in general in the excellent Happiness Hypothesis you realize that even trying to solve it is pretty hypocritical, since we are all, to one degree or another, hypocrites. But I do understand basic statistics, and I know that if 90% of people ignore fairness and take what they can get anyway, then if you want to be exceptional – to fall in that 10% – all you have to do is be fair. Even when – especially when – no one is watching. It’s as simple and as hard as that. It’s taking the crap job, not necessarily without complaint, not because you deserve it – but because it’s fair. Of course, you are at a disadvantage – because 90% of the other people out there are not doing that. All you have is one basic piece of knowledge that they don’t. This really brought back a conversation I had with my father many years ago. I don’t remember the specifics, but I was talking about a situation where I was ‘following the rules’ because I thought them fair to everyone, and being annoyed because so many others weren’t, seemingly with no consequences. He told me, “Not everyone thinks like you.” That phrase has come back to me many times over the years. I still haven’t figured out if thinking the way I do makes me a colossal schmuck or not. Perhaps I never will. For the next 10 days, do 5 intentional acts of kindness each day without getting caught by anyone. If you get caught go back to 0 for the day and try again.